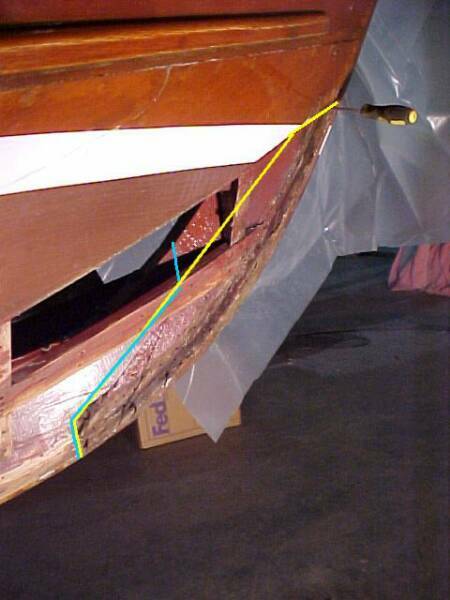 I’ll make a scarf joint, indicated by the red line in the keel and install new white oak end on the keel. The Yellow outline shows how I will be extending the knee and the light blue lines show where the assembly will be thru bolted. 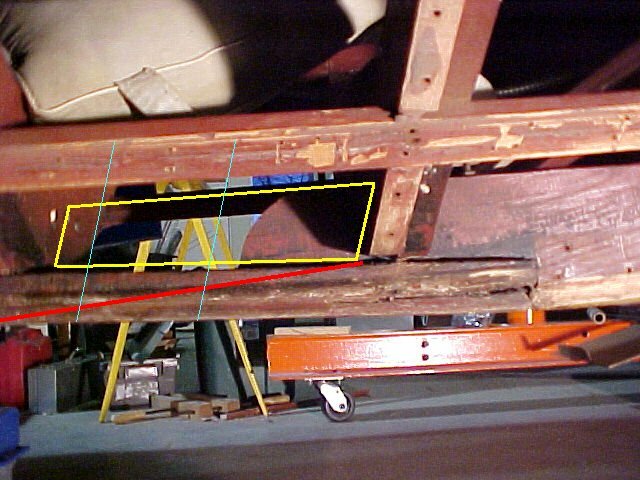 Rotted portion of keel removed. Will also remove Knee and replace rather than extend. Some exposure to rot, and just as quick to replace as to extend. This photo shows the rot in the stem. I saw where the bottom work was done in 1991 on the Century Boat Club website. I am not surprised that in the 13 or 14 years since some rot was repaired in this area, that there is additional work required. I will put the planks back on with 3M 4200. It will allow me to release the planks that I will be replacing so that a complete stem replacement could be done when it is time to varnish the boat. The repair will be substantial enough that you may not need to do the stem until the major refinish AFTER the next one. New portion of stem in place. See pictures below of condition of old portion of stem. This is a partial replacement of the stem to avoid major surgery at this time. I think this repair will likely go 10+ years. Some of the pieces of stem literally crumbled when removing it from the boat. – you can see in the picture below how there are pieces missing. The end of the stem that bolts to the Gripe or Knee literally crumbled as we took it apart. New portion of stem in place and notch cut for the planks to “land” on . Cutting this notch is a very tedious process. I’m sure a jig was used over and over at the factory! I first had to produce a jig, then cut the notch. Steam boiler – 4500 watt 240 volt unit produces steam within 10 minutes of being turned on. PVC pipe is the steaming chamber. The battens were steamed for 10 minutes each while we were removing the old 5200 sealant from the frames, planks and remaining battens. Stained, 2 coats of Sealer and 3 coats of varnish! Note the reflection of the blue bumpers for our large cruiser and Miss Donna’s own exhaust pipes ! When the varnish is complete there will be a new White boot stripe painted on. 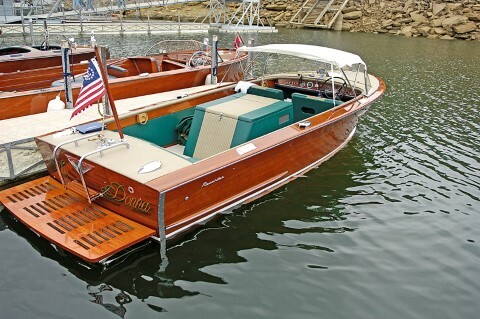 In 2005 Woodies did some major repairs and refinishing on "Miss Donna". The image at right was taken at the 2005 Bluegrass Chapter, Antique and Classic Boat Show. Below is a restoration log of the work done prior to the 2005 show which we have retroactively added to the site, enjoy! "Scratch" built siwm platform Note the taper on the sides. This taper matches and extends the lines of the boat. Finished swim platform and transom varnish. Notice reflection of platform in transom. Also see trailer work done for customer under the Trailers page!